We aquarium fanatics do a lot to ornate our underwater ecosystems. We put hundreds of dollars in line to purchase the best devices and chemicals to keep the bio-network running smoothly. And the most crucial part of every ecology is the light source. But, some factors make finding the best LED light for aquarium plants much more difficult than it should have been. The primary reason for this problem is the misinformation that circulates in the online community. Furthermore, electronic products are a common victim of misrepresentation. So, to clear out all the confusion, we have the complete package here. After going through this article, you won’t need anything more to end your quest for the perfect LED lights. Here, you will have every detail about the best products currently available in the market and a guide to make your hunt for the best-planted lighting easier. 1. What Is The Best Light For Aquarium Plants? 5.3. How does LED lighting work? Q: How do you setup LED aquarium light? Q: How much LEDs do you need for aquarium? Q: How does the color of light affect the growth of plants? Q: Why are my aquarium plants dying? Q: When should I turn off the aquarium light? 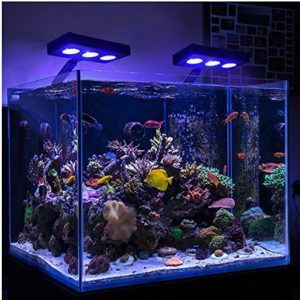 Q: How to program LED aquarium light? Q: Are LED lights good for aquariums? Q: Will LED aquarium lights grow plants? Q: How much light do aquarium plants need? Q: Which color light is best for an aquarium? Q: Do LED lights cause more algae in an aquarium? Q: How long should I leave my aquarium light on? 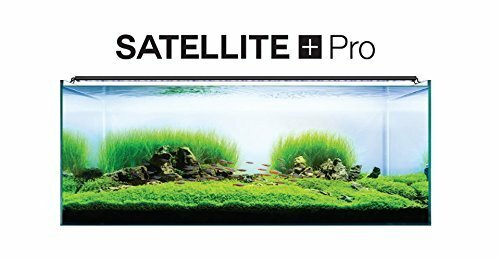 If I want to name one single product that satisfies all the needs of an expert aquarist, it would be Current USA Satellite Plus Pro. Go for it if you don’t wanna invest time on the products that you are not going to buy. This light is fully programmable and hosts eight modes and effects. The PAR value is also excellent although the price might be a drawback. But if you want the best of everything, the satellite plus pro is your choice. Now, let’s see which one is the best among them. Incandescent bulbs are only suitable for small aquariums, and they give off too much heat. Standard and compact fluorescent bulbs used to be a common feature in aquariums as they had a broader light spectrum and good intensity. But they are also falling into oblivion for the increased benefits of LED lights. The most significant benefit for LED lights is that they are customizable. You can choose the amount of color intensity and the length of your spectrum according to the needs of different plants. Furthermore, you can also program and set the transition time. And all of these benefits and more come at a meager price. So, LEDs are the future. Period. There is a lot to uncover when talking about electronics. Even when you pinpoint some of the best products that the market has to offer, it could be tough to choose the perfect one among them. It’s because they have similar characteristics. To solve that problem, we have listed the top 5 products according to our research. The chart below contains all the features of those five products side by side. All of them are good for different reasons. Choose the one that qualifies according to your requirements. State of the art design. Shimmer effect. Double peak technology. Here, you have the top 10 products that give you the best value. In this section, we have considered everything from high performance to low budget demands. Hopefully, you will find the best aquarium lighting for plants right here. At first, you may find the name satellite a bit funny. Then, after a couple of days messing with the remote and different modes, you realize there couldn’t have been a better name for this true weather controlling satellite. You can program and mimic every aspect of the natural environment your aquatic life could have faced out in the wild. Here, you will have blue moonlight, gray moonlight, cloudy day, overcast, sunrise, storm lighting, etc. modes. The color spectrum of the light rays can also be programmed to your comfort here. This light also features a moving cloud effect that makes the environment even more realistic. Red, green, blue and white colors of these modes and effects can be controlled by the remote. The time can also be set for sunrise and sunset. There will be a gradual increase in the intensity to create the dawn effect and a steady dimming of the light to mimic the dusk. Thus, you can set a 24-hour timer with this light. Controls are super easy to understand making it comfortable for the first time users to alter the environment in the aquarium. The SMD LED chips give you the accurate PAR you need for every condition. This new chip technology allowed the lights to be packed in that small aluminum case. It comes with a 120-degree reflector that distributes the lights evenly in the tank. This LED light is also easy to set-up and safe from electricity-related accidents as it operates 6500k LEDs with a low 12 volt DC power. More so, the ELT approved device is among the best LED lights for planted tank. 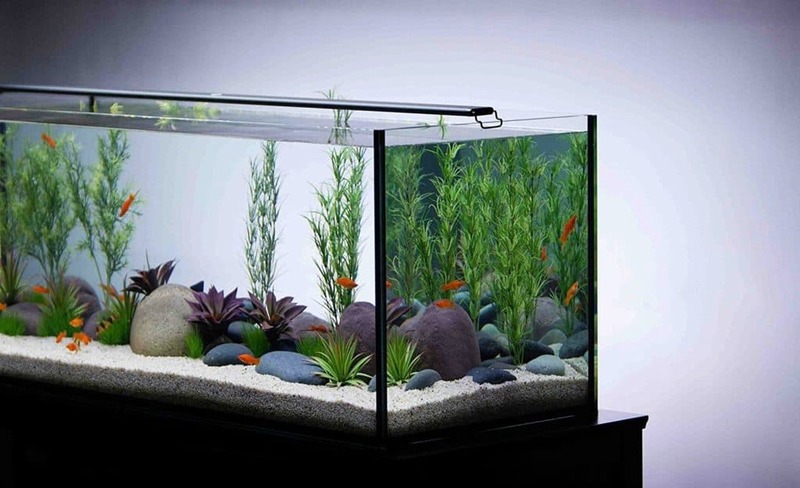 Having a planted aquarium gives you a tougher job to find the best light for your fish tank. However, to talk about the best, this satellite freshwater led plus by Current USA could be a great option. Coming in a wide range of 18 to 60 inches long, it gives adequate lighting to grow your aquarium plants. In a foot deep aquarium, the par value will be 45 in maximum setting on a sub-straight line. You will be able to choose from 12 modes. There are two lunar light modes, two cloud cover modes, two storm, and lighting modes glorifying the looks there are also sunrise, dusk, midnight (total darkness), and other necessary modes. Other than these environmental effects, you will also be able to control the color and light intensity that makes the garden beneath water even more manageable. There are 6 color presets which are optimized for fresh water. You can control the red, green, blue and white colors with the custom color option. This one is not as programmable as the Current USA Pro Plus, but it still has four programmable memory slots to give you the best control and settings in this budget. 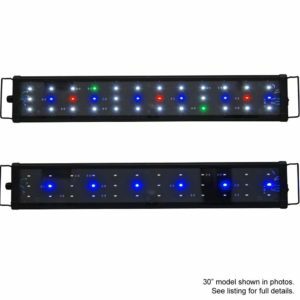 These features altogether make it the best LED aquarium lighting for the money. This is a DC powered 12-volt device. It is IP65 rated which gives its claim of safety even more reliability. The device comes with a wireless remote. 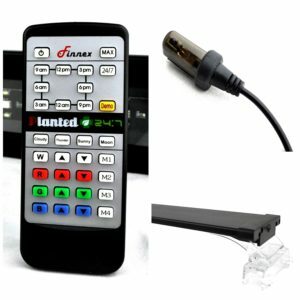 Unlike other brands, this remote gives you utmost comfort with a single push of a button. It consumes 60 watts of electricity which brings down the variable cost of your aquarium. The unit will give you 6500k white light and 445Nm blue light. And, all of these amazing features are packed in small aluminum waterproof housing. Gives a passable lighting that will not hurt the fish. Owns 6 different nonfading spectrum of colors. Possesses 12 dynamic effects and presets that include fading lunar, cloud cover, lightning, storm, dusk etc. The remote comes with 32 key options. The remote does not come with a timer option. The size might not go along with the size of many aquariums. The Kessil A360WE could be a great ray of hope for freshwater planted aquariums. Once you hang its fixture from a ceiling mount, you will be able to see a different view of your tank. Though Kessil is famous for their Reef Lighting products, this “Tuna Sun” is specially designed for underwater plants. 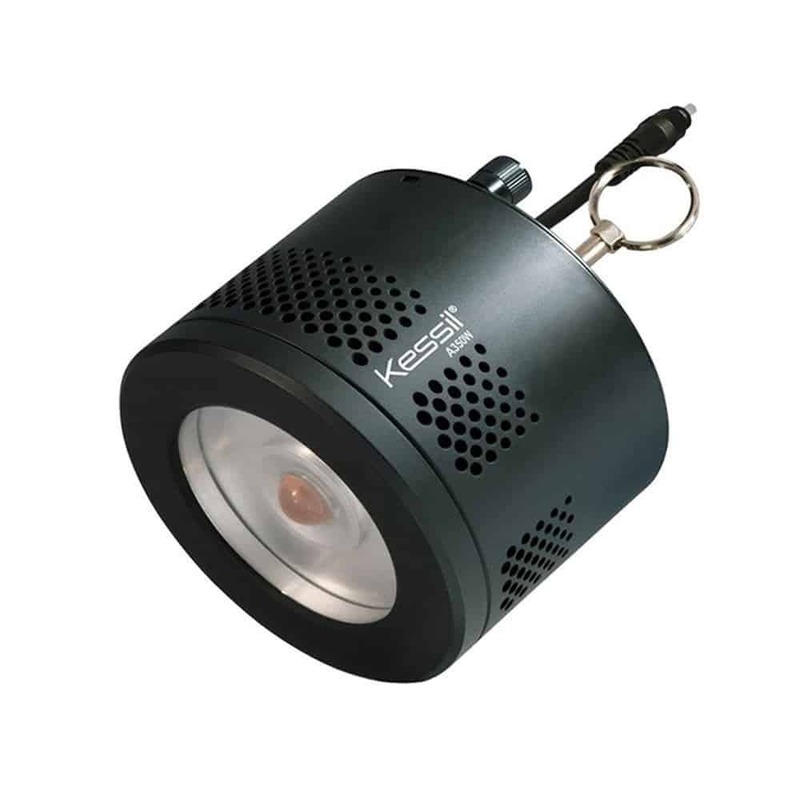 Besides, there is a system known as Kessil Logic through which you can pick an ideal color and spectrum with one knob followed by adjusting the intensity with another one. Speaking of the color, its range begins from a yellowish 6,000k to white in the middle followed by a pink 9000k. Moreover, the Tuna Sun also features a port to control the LED fixtures via aquarium controllers. To add more, it utilizes a technology called the double peak to produce wavelength that can imitate the sun. And the best thing about the Tuna Sun is that the lights are capable of emitting a beautiful shimmer so that it can give a look of natural sunlight on the ocean floor. And that is what the title describes. Besides you will find the LED bright white in color, that is stated to be quite high in par. You can hang the Tuna Sun as high as two feet and cover a aquarium of 24″ X 24″. Kessil A360WE Tuna Sun is intense enough even to meet the requirements of your most demanding carpeting plants. So, if you want a nutritious light for the greens in tank, this could be the best light for plants. The LEDs that emit a beautiful shimmer that imitates sunlight. It is small compact light. It is easy to tune lighting spectrum. It can penetrate deep inside the water to lighten it. Its shimmery effect makes the water plants pearling. The light brightens the color of the fish. It is able to emit light with widespread coverage. There is a fan inside the product that keeps on running, hence attracts the dust. Might not last for long. Aquarium plants happen to flourish when they get the touch of proper lights. For this, you will be needing the best light for planted tanks and Kessil can promise you that. Its A160WE series has been designed to raise the plants via providing a perfect range of lighting spectrum starting from 6000k to 9000k. Besides, the LED also creates the shimmer effect that duplicate the look of an Amazonian stream. However, just like A360WE, you can hang the product as well from the ceiling mount or bracket. Not only that, it also uses 2-knob Kessil Logic feature that you will find absolutely adjustable. A160WE can be considered as the little brother of Kessil A360WE. The difference between A360WE and A160WE is the power they consume. A360WE has a rating of 90 watts whereas A160WE requires 40 watts. So you need to consider the requirements of your plants carefully and measure the volume of your water so that you can select the right LED for your aquarium. 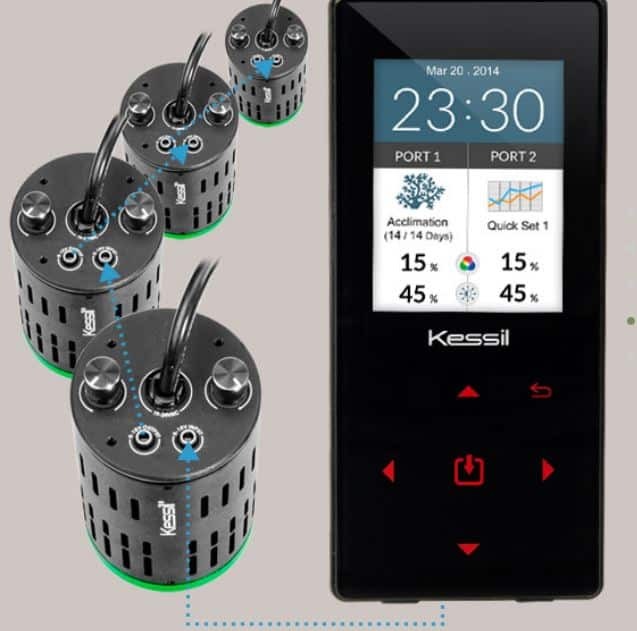 We recommend you to buy the digital remote with this or any Kessil light. Kessil makes by far the best digital remotes in the market. You are gonna have a manual and programmable options with two ports. It makes controlling the color and intensity even easier. You can also control these aspects with the nobs behind the light itself. Kessil will also let you have three quick set options with an acclimation mode. You will have two different ports in case you want to do two different spectrums. This LED light also has a shimmer effect to them. These also have the Kessil logic feature. It helps to make the water suitable for healthy plants. Its 2-knob feature is easy to control. Offers ideal range of lighting spectrum starting from 6000k to 9000k. Produces shimmer effect to lighten the water. Helps the plants grow and flourish. It’s easy to tune lighting spectrum. Goose-neck needs to be bought separately. Might not cover a greater area. The lights take many cables to link them together. The fan inside the product is a bit noisy and can attract dust. While you step out to look for the best light for the aquatic plants in your aquarium, the first thing that you might check is it’s unique features. And Finnex has the ability to offer you that. Since the title says it all, you can understand what wonders you will be getting once you get it for your tank plants. You will find a 24/7 light cycle in your remote that will allow you to set the time and light with a 3-hour interval. If it is noon at your location, then you will need to press the 12 pm button and from then on the cycle will start. You will be able to adjust the color of your LED for different times of the day. Transitions of colors for different times of days are also very natural. It will give you the red dawn and the setting sun. You might even catch the reflections of cloud once or twice in a sunny day setting. The most spectacular mode is the graceful blue moon. This aquarium light features cloudy, thunder, sunny and moonlight effects. They are not like other cheap effects that you never use after the first taste. These are something that you might want to show off. You will also be able to adjust the red, blue and green colors and save that to the memory. There are four memory options in this device. Another cool feature is the reset button that most of the LEDs lack. The maximum par value for this LED is 95. This product will hopefully last you a long time. It is built with high-quality waterproof aluminum which is capable of mounting a rimless aquarium. The slide legs also allow it to adjust according to the width of your aquarium. Its 7000K LED lights create nutritious water conditions. It has 24/7 mode to work automatically. Offers different moods of the sunlight such as Blue Starry Night and Fire Red Sunrise. 7000k Multicolor Blend for Plant Growth. It comes with 4 customizable color channels. One remote rules them all. The cable is quite short. When you look at the products and updates of Finnex, you will feel that they are listening to their consumers. After the last planted LED light came out, one of the things that people were talking about is that there is no way one can customize the light spectrum. Luckily, you now have the CC which is customizable. They also heard their customers’ call for color and intensity. Finnex achieved the true 660nm red LEDs with this light. This is the sweet spot where your plants get the best red-yellow light for growing fast and tall. Some people might think that the color is not looking so good. But this creates the best environment for your plants. Planted+ CC has a similar color control and remote system as the Planted+ LED. Here, you will also have 24/7 control in an organized manner. This features four weather effects. Those are cloudy, stormy, sunny, and blue moonlight. There are two colors in the IR sensor for the reduction of confusion. You will also be able to control the colors with great precision. This LED features red, green, blue, and white lights. There are four memory slots where you can save your color and time configuration. You will also have a great transition. The slow and red dimming and raising of color stunningly mimic the sun. The mounting options are also unique in this 48-inch wing shaped fixture. Legs of the LED will raise the fixture according to your need. You can also use them as a bracket to hang your light from above. The clear legs can extend and take a little amount of rocking that we don’t see much in the market. You might get confused with this product as there are two versions of it. One of them is the edge & edge reef LED light fixture, and the other one is edge Wi-Fi light fixture. You might already have an idea about their main difference, but there is more to it. Let’s talk about the edge & edge reef LED first. This has a low profile. There are two items of edge and edge reef. One of them will fit 35 to 38.25-inch aquariums, and the other one fits on 47 to 50.25-inch aquariums. It has a dispersion angle. The Kelvin rating of white color for both items ranges from 6000K to 10,000K. It also features blue, red and blue lunar LEDs. These two fixtures will create a beautiful sunrise and sunset effect by raising and dimming the color in every 10 minutes for two hours. It is also programmable. 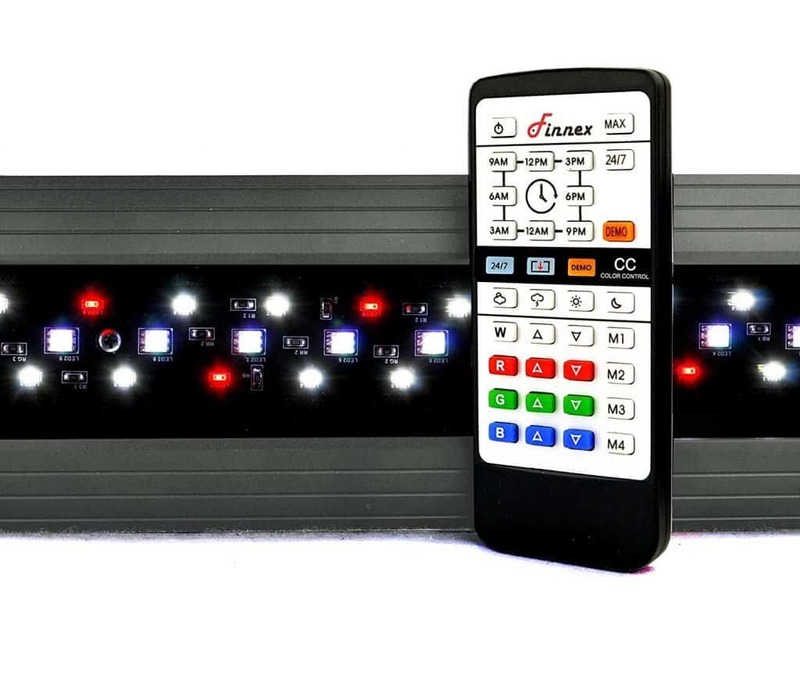 There is a three-channel timer which enables you to program every light independently and create many effects. It has a robust extendable arm that keeps the fixture safe. 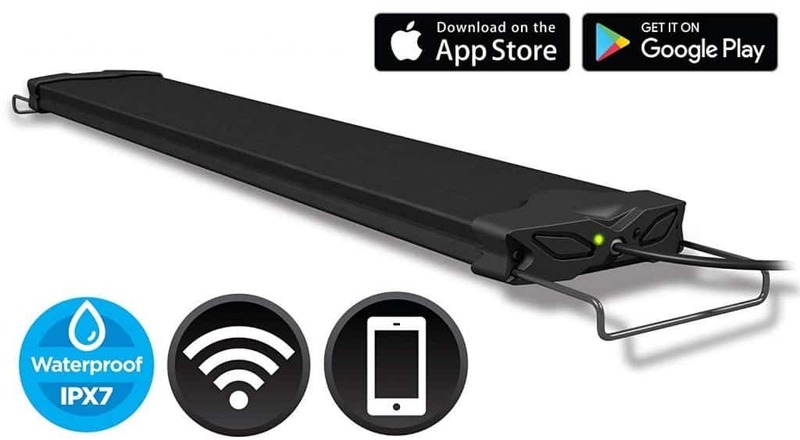 Now, let’s come to the edge Wi-Fi LED aquarium light. This is a better and more feature rich version of the previous edge version we talked about. I will just mention the changes and extra features that this fixture holds. This version of the edge features a smartphone app by which you can control the environment even better. You will also have more data about your aquarium. This is available in 24”, 36” and 48”. It has a four-channel integrated timer giving you better control. You will also be able to group channels with this device. Both of these fixtures are made waterproof with aluminum housing. They will not create any noise and have a 1.5 meter DC cord and 1 meter AC cord. If you are looking for an excellent option for a nano planted tank then Finnex FugeRay could be the obvious choice. But it doesn’t stop there. Starting from 12 inches option it goes all the way up to 48 inches. With it’s lunar blue moonlight LEDs, it emits amazing light environment that will make the aquarium stunning. Moreover, it also possesses the ultimate plated LED clip light that you can utilize for spreading the light for the plants. Besides, it features a complete package of daylight and blue LEDs with the true 660nm RED LEDs. There is also an option of turning the red one or the blue one. There is a confusion with the wattage consumption. On the package, it says that it consumes 15 watts whereas on the battery, it is 5 watts. Our research shows the latter to be true. The unique design keeps the lights cool giving you a 40,000 hour constant use lifetime. To add more to it’s feature, this LED light uses plastic and aluminum material which shows it’s waterproof feature of the material. And the PC Splash Guard will be there for the rescue if any mishap happens. Furthermore, to talk about it’s design, Finnex FugeRay Planted+ Aquarium has been developed with contemporary ultra slim look that beautifies the tank really well. Beams Work is one of the big names in the industry. And it’s about time that they are thinking about their low-income consumers. When you are reading a review of this product, don’t compare it with other prominent fixture high PAR lights as it was not meant to do that. This LED light for growing aquarium plants feature 2 usual modes: daylight and moonlight. While the daylight provides full spectrum and power to brighten the tank as natural as possible, the moonlight on the other hand gives a dimmer night time lighting effect. Besides, the product is pre-wired so you can use it with an optional timer feature so that you don’t require to manually switch between the modes all day. But for this, you will need to pay a bit little more money as the timer is sold separately. However, talking about the modes, they are pretty helpful for the plant inside your aquarium since it will help them grow effectively. 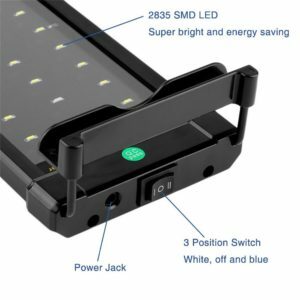 However, another great thing about the product is that the LEDs come with energy saving feature so that you can utilize the light for a longer term. In addition, the product has brackets that you can adjust to different lengths for the fixture as they are extendable. Speaking of the LEDs, the product owns Actinic 460nm, Green 520nm, and Red 620nm spectrum LEDs that are absolutely suitable for freshwater plants. Hence, if you want your green creatures to live happily, this would be one of the best lights for aquatic plants. Can fit the tank perfectly. Its pre-wired setting makes it easier to use with optional timer feature. Helps grow the plants (less demanding ones) healthily. The LEDs are energy saving lights. The brackets are extendable so you can adjust the way you want. The timers modules are sold separately. Adapter can get really warm. Might face difficulty in mounting. This device is without a doubt the best budget aquarium light in the market. It not only has a low price tag but also has a minimum power consumption saving you a lot of money and benefiting the environment at the same time. The only major drawback in this device is that it is not waterproof. And, NICREW has done a lot to inform you about this information. So, don’t get it in contact with water. You will instantly kill it. Use a glass base for increased protection. It has amazing brackets. The metal brackets are very strong, and they can extend to about a foot. The default length of the fixture is 36 inches. But, with the adjustable bracket, you can extend the reach to about 48 inches. One of its highlights is the high per value in this incredibly low price. The device has two kinds of lights. One of them is bright white, and the other is dim blue. In a one foot deep tank, the PAR value of the white lights is 32 PAR, and the par value of the blue lights are 4 PAR. Without the brackets, the white lights have 36 PAR. When we called it the best budget light, it was for this PAR value. There is no other product on the market that will give you better lighting in this low budget. It has adjustable legs. But they are not very strong. The built quality is average and hopefully will last you for a long time if you don’t get into an accident. The band is not that old. So, you can count that as a minus, but they are giving a pretty good service yet. You cannot hang it over the tank. There is no timer included. The product is mostly plastic. Choosing the best-LED lighting for a planted tank is half the job. Rest of the performance depends on how you use your gadgets. We have mentioned before that mashing electronics in botanical endeavors is not an easy task. You will not find much information on it online, and if you do find some, it will hardly be reliable. 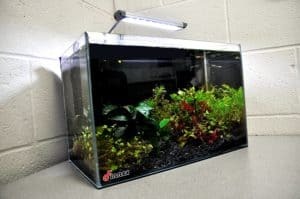 So, if you don’t have a lot of experience with planted aquariums LED lights, then read this part carefully. Firstly, you will come across some terms that you might just have a faint idea about. Let’s learn them, heart and soul. This metric comes a lot when you talk about LEDs. PAR stands for “photosynthetically active radiation.” The area of the light spectrum that plants use to drive photosynthesis is called photosynthetically active radiation. Visible light has a wavelength of 380nm to 750nm. And plants can use 400nm to 700nm. So the minimum and maximum range for PAR is 400-700nm. When buying a light, checkout how much PAR it is giving as that is the primary metric that you wanna follow. Also, try to find out how much of the light spectrum the LED is covering. The study of different colors or wavelengths affecting different parts of a plant is called photomorphogenesis. For instance, we know that white lights stimulate growth, red light makes the plants tall, and blue light helps the leaves grow more. If you have a better understanding of it, you will be able to control your pants more comfortably and prevent unwanted growth. Different plants need different wavelengths. Herein, Photomorphogenesis will help you with this too. There are other advanced terms you might bump in when studying for aquarium plants. But as it is a 101 basic article, I will skip them. Secondly, here are some things that you need to be aware of to have a nice underwater garden. This refers to the consistency of lighting. Your plants should have consistent lighting every day. This is by far the most important thing in aquarium farming. You need to have a timer for maintaining this consistency. Set the timer and transition for accurate light transitions. You also have to calculate the amount of ambient light that the aquarium is receiving and compare it with the natural light for the fish tank to prevent algae and overgrowth problems. The intensity of light is measured in kelvins. Generally, you will find lights from 2500K to 10,000K. Now, plants don’t care about the intensity that much. What they are looking for is the color of the light. So you don’t have to take a lot of hustle to find the best intensity. Take one that has 7000K because it looks as the aquarium in direct sunlight would look. Lights below 3000k are cheap but don’t go for them as their power consumption is generally high. The LED lights are not only used to illuminate the tank but also utilized to grow the plants as they are the food of those green creatures. LED lighting is actually a group of small LED lights that have been arranged in a specific order to emit a bright light. It’s basically short for Light-emitting Diode. Basically, the electrons are transformed into photons when the diodes are connected to an electricity source. And these photons are called the packets of energy that are generally perceived as bright light. The light can have a particular wavelength or color or particular intensity. The lights of different wavelength are connected in sequence so that it can emit a vivid blaze to the tank. And this is how LED lighting works. However, LEDs come with a lot of feature starting from its durability to saving a lot energy. So, you will get many perks from the light once you buy it for your aquarium plants. Lumen rating doesn’t have any significant implication on planted aquariums. It tells you how bright your light is, but plants don’t care for that. We measure light in PARs here. Plants also don’t care about the Kelvin rating. It is more related to human eyes. Watt per gallon doesn’t have any effect on your plants. But you need this metric as it does have a significant impact on your wallet. It tells you how much power the LED consumes to produce light. You don’t have to be a nerd to grow plants. You can go to your local supermarket and buy a daylight bulb to start farming. Maybe slow but plants will grow in that condition. When you want to dive into this realm and grow some unique plants, you need all of this studying. Just because it is expensive, it doesn’t mean it is good for your plant. Most of the plants will not require costly lights. So, don’t go fancy for them. Most lights work similarly. The difference is between your plants and aquarium. Modes and effects like lighting, cloudy, simmering, etc. does not affect plants. They are there for increasing the beauty of your tank. So, this wraps up all the basic elements of the planted aquarium led lighting guide. I hope, this equipped you well enough to start aquarium plantation with confidence. There are lots of factors you need to consider before selecting the appropriate light for your planted tank. First lets discuss about the types of plants and their requirements. You need to choose your plants first and then select the perfect light to meet their requirements. Underwater plants can be picked up depending on their position at 3 different location. So you can categorize them into 3 which are Carpeting, Midground and Background. Although you will be interested to get different kinds of plants for your aquarium and the pet fish, but you need to get the one that will benefit the creatures inside the water. And not only that, the quality of the water also counts for maintaining the tank. Plants add beauty to the aquarium once you fill it under the water. But you need to keep certain things while you plan to plant them. However, as we have said that there are 3 categories of plants based on their location, we will discuss them in detail so that you know more about them and their lighting requirement. Dwarf Baby Tears: Hemianthus callitrichoides or commonly known as dwarf baby tears are admired the most because of their vibrant look and nature. Baby Tears can be a healthy carpet plant of the aquarium as they beautify the aquarium to a great extent. Having very tiny sized leaves they create a sense of depth and vastness even in a small aquarium. Under high lighting and pressurized CO2 they will pearl heavily which is immensely pleasing and one of the prettiest things to watch. Appearance: Low, thick and vibrant. Carpet like growth pattern. Water Temperature: Can tolerate between 75°F to 85°F. Grows faster around 73°F to 75°F. Glossostigma elatinoides: Glossostigma elatinoides is considered another wonderful carpeting plants. It is one of the smallest aquatic plants (2-3 cm tall), as a result can be used in the foreground of the aquarium. Glossostigma requires high light and high CO2 to flourish. You need to trim them frequently to get a compact growth. 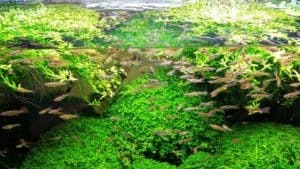 Java Moss: This is quite the most popular plant for aquariums. As they need low maintenance, aquarists tend to prefer them mostly. However, the Java Moss plant grows very quickly onto rocks and not only that they are tough to die. Water Temperature: Can tolerate 80°F to 90°F, but grows the best in 70°F to 75°F. Lilaeopsis: This is another grass like plant that grows up to 2 inches long. It does not only spread fast but also fill the whole aquarium with its greenness. However, it might require periodical prune if it invades other plants. Appearance: Green and grass like. Mid-ground plants mostly belong to the low maintenance plants with impressive look. You can plant them at any space of the tank. They are semi-striped and own thick leaves that appear in bunches. Green Tiger Lotus: It’s a wide-leaf like plant that require very low maintenance. Regular environmental condition helps the Lotus flourish. Appearance: Wide, medium height, green leaves. Pygmy Chain Sword: They duplicate the nature of grass and for this they are quite well-liked. The reason Aquarists like to go for them is because of their tendency to mimic the dry land type aquascape. However, many of the other aquarists might find them mainstream and boring and end up avoiding them. Water temperature: 70°F to 85°F. Anubias Nana: The plant grows up to 6-inch long and possesses dark oval leaves. It requires low care, and is great for the beginners. Appearance: Medium sized, oval leaves containing dark green. Background plant hides fixtures and offer hiding place for your freshwater fishes. They too require little care and can spread out all over the tank on the bottom of the aquarium. 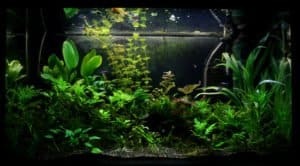 Amazon Sword: The Amazon Sword is easy to maintain type plants. They do not only grow fast and big up to 20 inches but beautify the area as well if arranged appropriately. Appearance: Big sword like leaves. Lighting: Low to Medium light. Pond weed: This plant is basically known as Elodea Densa. It is suitable for both temperate and tropical aquaria and is very easy to thrive. If you give them a lot of lighting and fertilizer, they will grow faster. African Water Fern: This is another great plant that is ideal for background. It thrives in most condition and needs low care. Appearance: Lush feathery green leaves. The spectrum basically tells us about the color of the lights. Plants respond very differently to the color of the light compared to human eyes. Plants love the blue and red area of the spectrum and thrive when hit by this kind of light. This plays a crucial role in photosynthesis and, if done right, will result in a beautiful aquarium full of vivid colors. Freshwater plants thrive under the source that resembles natural sunlight. Anything between 5500K-6500K spectrum is great for freshwater plants. But to make your aquarium look aesthetically pleasing you can increase the color temperature up to 10000K. Here are the colors that are used for the plants so that they can get suitable lighting atmosphere. This kind of bulb produces a light spectrum that mimic the sun basically. Its visible spectrum is maintained while the infrared and ultraviolet spectrum are reduced. It owns lots of Actinic Blue and red and helps the plants a lot for growth. Plant utilizes a particular kind of blue which is known as Actinic Blue. It helps in the growth of plant leaves and stems. This spectrum allows the plants to grow bushy and leafy. This color is used for creating more viewable light although it is not efficient for thriving plants. Plants also use Red lights for their growth. Mainly they are important to produce flower and not only that, it also lets them grow taller. The coverage of LEDs should always be selected according to the size of the tank. The taller your aquarium is, the more power you require. As for instance, if you light up a flashlight onto the tank, every 4-inch of water will receive the flashlight twice as strong for keeping the same level of brightness. If you own a large tank, you will need lot of space to light up, hence you will require a light having a vast coverage with widespread intensity. 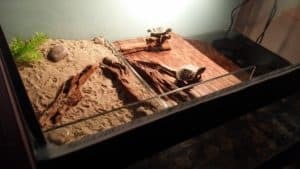 Suppose you own an aquarium that measures about 1 foot deep, you may work out with getting a low-powered fixture and still pull off a medium light. But, putting the same fixture on deeper aquarium will keep you in the lowlight class. Contrariwise, putting the powerful fixture on the same depth aquarium will emit the light so bright that it will rather become hard for you to thrive plants. It’s because, you will be putting so much carbon di oxide and fertilizer in your aquarium to fight with that much light, that it would actually end up hindering you. And for this, it has always been recommended to have an LED depending on the size of the aquarium. Tank size: You should always buy the LED light according the size of the tank that you own. If you have larger aquarium, you will need the light having widespread intensity and vast coverage. Plants type: Different type of plants require different level of lights to grow. If you own plants that are in their growing stage, you will be needing a different level of intensity that might not need at other stages. However, you will get a variety of LED lights for each of their requirement. Intensity and Spectrum of light: You might discover a considerable range of spectrum and intensities while you look for the LED lights for your aquarium plants. They are useful for different types of your plants and for their stages of life cycle. Depending on which type and stage your plants are in, you will need to buy the one that will be right for them. Substrate and Pressurized CO2: Only high intensity LED light won’t give you the result. For a healthy planted tank you need balance. And to ensure balance you need proper supply of CO2 and best substrate for planted tank. If you are on a budget and purchasing a light that does not give you an above average performance, then skip purchasing. Save some more and get the best light in the market later. You might say that some people are growing plants with backdated equipment, but that is rare and hard to do. The chances are all of your plants will die in your first mistake. So, try to get above average tools. When you buy your plants from vendors, most likely they will be sitting under state of the art lighting. If your lighting is too distant from their original lighting, then they will all die soon. Thirdly, when you go out to buy an LED, you need to have a clear view of what are you going to buy and what features you want in what price. So here is a list of attributes you’re gonna be looking for in your aquarium lighting. Timer: As we mentioned before, timers are very important. Ask a person who has forgotten to turn on or off his lights for just one day. It could take months to fix the damage. Even a delay of 10 or 20 minutes can have a vastly negative approach on your plants. So, a 24-hour timer is a must. Its transition should be gradual and smooth. It is better if it has a sunrise and sunset feature. Some LEDs feature multiple memory options. There you can set and record your transition times, color, intensity, and effects. Longevity: An aquarium light is a long term investment. You have to make sure that it will serve you at least for four years. To ensure that it has to have strong housing, generally, aluminum or good quality plastic is used to make the case. The built quality also has to be premium quality. Faults in design can rapidly cut short a LED’s life. It also should be waterproof. When electronics are working in water-related environments, they cannot but be waterproof. Light & the Spectrum: When you are looking for an LED light, make sure that how much of the light spectrum the light covers. It has to be between 400nm to 700nm. Anything over this range does not have any use. Remember that the plant’s absorption and action spectrum tells us that they take most of the blue and red part of the spectrum. So, the number of blue and red lights should be more on the LEDs. White lights should have the largest concentration. Other than white or blue light for aquarium, you will also need a bit of the green spectrum. Bracket Design: You might take it as an insignificant part of your LED. And it is, compared to other more advanced components. But a lousy bracket design can also unleash a world of pain for you. All of these designs can be either good or bad. But you have to be extra careful about the docking legs. Sometimes, the legs are just a pair of wires. Some might not even have a barrier to stop the legs from coming out of their place. If you have an accident, the LED can easily slide into the water probably destroying it. Use arm mount with only the lights that have a wide dispersion angle. If your aquariums are rimless, you must have a rimless mount or a screwed mounting system. Brackets must also be adjustable. Otherwise, you will be stuck to a particular size and spend extra for a glass base. Glass bases also reduces the performance of your light. A: It depends on the type of your LED. The set can be both easy and difficult for many of the people. So it’s important that you work it out in the right way at the first place. Poor setup will not only cause accident but also will lead to the death of fish. However, almost all the manufactures provide setup guide with detail process and diagram with their product. All you need is to follow them step by step and then you are good to go. A: The amount of LED depends on the fish and plants you have in your aquarium. For easy maintenance plants, anything ranging .25 to .5 watt per liter will work out fine to keep them live properly. However, if you have developed plants, they will need about 1 watt per liter or more. And you must ensure that you own a good reflector in your aquarium so that it helps in providing better reflection and keep the temperature well-regulated. A: LED lights are expected to produce a spectrum of light which you know them as colors. Such light possesses colors that are visible or non-visible and thus it’s essential to know the appropriate type of light that will play a major role for your plants growth. However, the basic rule of thumb is that you will need a bright light for your plants to activate photosynthesis. The red and blue zoned lights belong to visible category that is necessary for the plants. However, you can expect to get a variety of colors in between these zones that will be required for plants growth. A: There could be a number of reasons for that. Not necessarily all pointing towards your lighting. You need to carefully check the requirements of your plants. Sometimes only good light is not sufficient enough if there is lack in the supply of CO2. If you are having high demanding plants then you need to match up with the CO2 supply as well. Next you need to check the water parameters and adjust liquid fertilizer dosing to get healthy growth. Unstable water parameter will cause algae bloom and hurt your precious aquatic plants. A: When you are starting a planted tank the amount of plants will be less and as a result the light requirement will be less also. So it is safe to start with limited lighting hours. Start with 6 hours per day and gradually increase the time once the plants started to take root. At full growth and proper balance in the tank the lighting hours should be 8 to 12 hours per day. You need to find the balance by yourself because every aquascape is different. A: In most of the commercial LED lights you will find a built-in timer to program the light as per your requirement. If your LED light doesn’t come with this feature you can simply install an external digital timer to automate the lighting hours and make your life easy. Also if you control the light manually there is high chance of timing hour fluctuation which will make it difficult to get balance in your tank. Now, you have to understand that being good for aquariums and being good for growing plants are not the same thing. The cost is generally high to make an LED to perform well with the plants that need a broad light spectrum. A: Yes, of course. Otherwise, it wouldn’t be able to take the market by storm. Instead, it is preferable for growing versatile ecosystems and exotic plants. You have to know the right amount of color intensity and PAR requirements. It says that plants take carbon dioxide (CO2) and water (H2O) and the energy from light to create sugar (C6H12O6) and oxygen (O2). It is the sugar that helps them grow. Now, different plants need different light spectrum. Some needs high red and other requires the high blue part of the spectrum. You have to identify the spectrum length and set your LED on that and your plants will be healthy like never before. A: When people ask “How much” we assume that they are talking about two things; intensity, and time of light emission that a plant requires. It depends on the type of plants in your aquarium. You just have to mimic the environment that the plant would initially have in nature. Plants from tropical region require an intense light whereas plants from rivers and swaps require low light. Plants that come from near the equator need more extended daylight (12 hours) where plants further from the equator needs less sunlight (8 hours). The time could be 8 to 12 hours depending on the plant’s origin. And the intensity should be 15-30 PAR for low light plants, 30-50 PAR for medium light plants, 50-80 PAR for high light plants, and some hungry plants require more than 80 PAR. These values should be measured in a substrate surface under 1-foot deep water. A: You will generally find four types of color in LED fixtures. They are red, white, green, and blue. A combination of these colors or a completely separate set of lights can create other colors like magenta, yellow, pink and other shades. From these LEDs, you have to produce the best light spectrum for aquarium plants. All of these colors have different purposes, but not all of them are used by plants. Plants mostly use bright white and red. From the study of photomorphogenesis, we know that white color helps the plans to grow faster and red makes them grow taller. This red light can also lessen the algae growth rate. Plants also use a special kind of blue. Its name is actinic blue which helps the growth of leaves and stems. 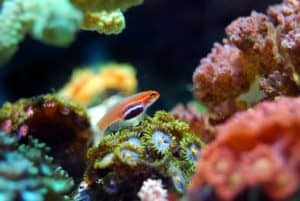 Other colors are there to give you a better view of the aquarium’s environment and make your plants and fish look good. A: Growth of nuisance algae is not linked to all the LED lights. They are related to a particular spectrum of rays that stimulate their growth. Algae is like every other plant. They use light to do photosynthesis and produce energy for themselves. Every plant uses a particular part of the spectrum. Herein, Algae uses the green and yellow part of the spectrum to multiply their numbers. So, if your LED has more green and yellow lights, the number of algae can increase. Let’s put it this way, whenever you have excess nutrition in the tank there is a high chance that algae will make use of that extra nutrients (light, fertilizer, co2) and grow. The key factor here is the balance of everything. A: Again, it depends on what kinds of plants are you farming. If the plants require more light, then you should go for 12 hours, and if they are the kinds that need less light, then you can do 8 hours. You have to do some research with your plants. Time would also depend on the intensity of the light. If your light brightness and color are not adjustable, then you need to lessen the time of light exposure. Too much light can cause algae to overgrow and create problems, and too less light means low plant growth. So you have to keep the balance between them. Even if you get the best LED aquarium lighting for plants, they will not survive under the mismanagement of time. Sorry for being so verbose but I had no choice. Aligning electronics with bio-networks is not an easy task. On the bright side, you will find everything here that you need to find the best LED light for aquarium plants. Hopefully, you will not need to visit any other site after this article. For any confusion or question don’t hesitate to contact us or just comment below. Excellent article, really loved the information gathered together in one place. i am a big fan of kessil, been using one a160WE Tuna sun for my planted tank. the end result is really awesome! From my experience what i understand is it is more important to measure par and find out the balance point for your tank. every tank is unique and the requirement is unique depending on the plants there. so you need to do some trial and error to find the balance and measuring par will give you a good head start for this. happy fish keeping! Amazing article, learned quite a lot indeed! I have been in the fishkeeping hobby for quite some time now, though mostly freshwater stuff. Recently I am planning to build a reef tank with all the necessary gears and equipment. Do you suggest any particular light for a reef setup with mainly focused on SPS and a few LPS? Also what I understand is that the PAR value measuring is very important. So how can I do that without a par meter? Is there any alternative option? Thanks for this post Anne. Quick question: Do you think these lights would help plants grow outside of a tank? Or should I be looking at grow lights for that instead? Thanks Anne! Hi Kevin, Thanks for reaching out. Yes you can use them to grow plants outside of the tank. As you may know when we start a planted tank in DSM (dry start method) we still use the same lights when there is no water inside the tank. But may be you will get cheaper options in grow lights whereas aquarium lights have a bit higher price tag. PrevPrevious PostSunSun Canister Filter Review – Can It Live up to Your Expectations?